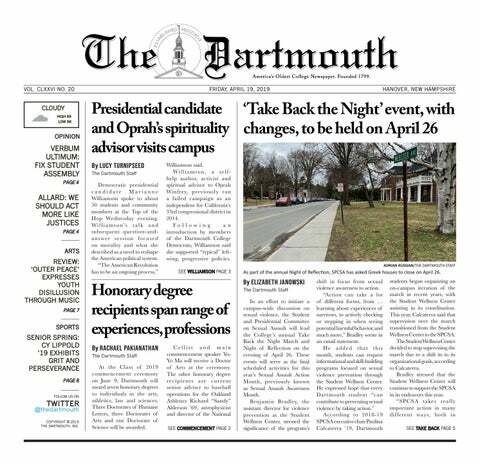 Dartmouth’s Office of General Counsel recently released a draft of a new Unified Sexual Misconduct Policy and Procedures in order to get feedback about the proposed policies. However, members of the student body have expressed concerns that students have not adequately been able to offer feedback on the draft, which was written as part of the College’s new Campus Climate and Culture Initiative. According to a recent study, children aren’t pestering their parents for sugary cereal just because of the taste — a team of researchers from the Geisel School of Medicine found that flashy television advertisements aimed at young viewers are contributing to preschoolers’ consumption of high-sugar cereals. “After years of research, I’m not sure parents truly appreciate how powerful marketing is to kids,” biomedical data science and pediatrics professor and lead author of the cereal study Jennifer Emond said. “As parents, we have a choice: we can shield our children from this marketing through controlling what we show our kids, or we can demand better guidelines,” Emond said. The purpose of the research was to confirm assumptions and fill existing gaps in science literature about the impact of advertisements directed at children, according to Emond. By 2020, two design and engineering students hope to have made campus a little happier. Julia Huebner ’20 and Sophie Frey ’20 formed the Collis Wall Project earlier this term to build a piece of public art in the form of a Rube Goldberg machine — a device that performs a simple task through a chain reaction —in the Collis Center by June of 2020.